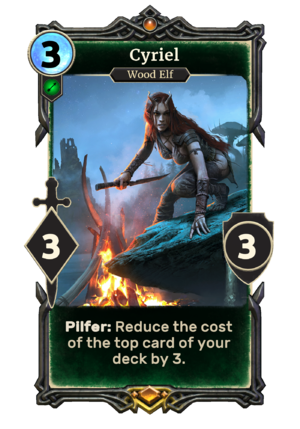 Pilfer: Reduce the cost of the top card of your deck by 3. Cyriel is a unique legendary Agility creature card. It is part of the Isle of Madness story set. "I'm sure I don't have any idea who took your coin purse." This page was last modified on 25 March 2019, at 11:56.